I received a review copy of this book from Open Letter Press through Edelweiss. This book was originally written and published in Bulgarian in 2011. It has been translated into English for this edition by Angel Rodel who won a PEN Translation Fund Grant in 2010 for Georgi Tenev’s short story collection. She is one of the most prolific translators of Bulgarian literature working today and received an NEA Fellowship for her translation of Gospodinov’s The Physics of Sorrow. In The Physics of Sorrow the story of the narrator, Georgi, and his family are told through the lens of the ancient Greek myth of the Minotaur, the half-man, half-bull creature that inhabits the dark tunnels of a Cretan labyrinth. The story itself feels like a labyrinthine journey which the author leads us through; we feel like we are groping around in the dark, never sure towards which style of writing the author will lead us next. Sometimes we encounter a story about the narrator’s grandfather, at other times we are launched into a tale about the narrator himself. Short stories, anecdotes, memories, pictures and even lists are presented as part of the narrative. Gospodinov uses the story of the Minotaur from Greek mythology to highlight three themes in his book: abandonment, isolation and misunderstanding. Jorge Luis Borges, in his short story “The House of Asterion,” provides us with the Minotaur’s perspective of his dwelling and his pathetic hope of eventual redemption. The Physics of Sorrow expounds on Borges’ characterization of the Minotaur as a creature who is worthy of sympathy and whose half-human, half-bull form are certainly not his fault. At some point in his young life Asterion, the Minotaur, must have been abandoned by his mother and placed in this dark, isolated and lonely labyrinth. Georgi grows up in Socialist Bulgaria, which itself is an isolated and lonely place. The author points out that before 1989, 80% of Bulgarians had not left their native country. Georgi’s parents have good jobs, but due to the strict controls by the government on housing, his family lives in a cramped basement apartment, their own type of dark labyrinth. Georgi tells us that because of his enclosed childhood dwelling he is afflicted with the “Minotaur Syndrome.” Left alone from the age of six in this basement apartment he must fend for and amuse himself until the adults come home at the end of a long day. Abandonment and isolation are situations which Georgi’s grandfather struggles with first in the story. At the age of three he is almost left behind by his mother at a mill and not until they are half-way home does one of his seven sisters realizes that he is missing. I held my breath at the vivid description of the toddler’s abandonment and thought “hurry up” as his sister raced back to gather the distraught and afraid little boy. The grandfather, who later fights in World War II, also has one of the toughest choices to make in the novel: which of his two sons should be abandon because he cannot live with and raise both of them. Georgi has an issues with intimacy and he can’t seem to truly get close to a any woman. His fear of intimacy is part of the reason that, shortly after his daughter is born, he falls into a deep melancholy. At his doctor’s advice he travels around aimlessly and Europe itself becomes his labyrinth where he trudges from city to city and hotel to hotel trying to shake off his extreme gloominess. He abandons his family to try and save his sanity but he ends up isolating himself from the world even further. After he leaves his family, Georgi moves back into his boyhood home in the basement and now, living in this dark labyrinth all alone, the minotaurizing of himself has become complete. At the end of the novel he tries to use the language of quantum physics to describe, sort out and even deal with his sorrow. The greatest lesson we can take from The Physics of Sorrow is one of empathy and compassion. At one point in the book the Minotaur is put on trial and given his day in court to defend himself against the charge of being a violent monster. He is half-man and half-human and therefore never able to fully fit into to any society, man or animal. We must also show compassion for characters like Georgi who, growing up under a totalitarian regime, lost some of the most basic freedoms we take for granted in the West. This book shed a whole new perspective for me on the story of the Minotaur and the country of Bulgaria which, to be quite honest, I have never really given a second thought. Georgi Gospodinov is the author of Lapidarium (a collection of poems, 1992) – National literary prize for debut book; The cherry tree of a nation (a collection of poems, 1996) – Annual prize of the Association of the Bulgarian writers for book of the year; Natural Novel (a novel, 1999) – Special prize in the national contest “Razvitie” for modern Bulgarian novel; And Other Stories (a collection of short stories, 2001). 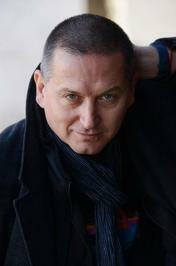 He is the co-author of: Bulgarian Crestomathy (1995); Bulgarian Anthology (1998). He works and lives in Sofia. 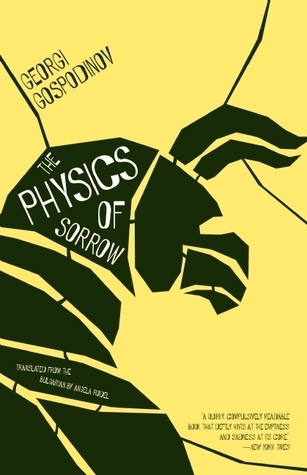 Follow this link to read an interview with Godpodinov about The Physics of Sorrow: http://bombmagazine.org/article/453046/georgi-gospodinov. Sounds fascinating. I have a copy on the way but don’t know when I will get to it. This will also be my first Bulgarian read. It is definitely fascinating! When you read it stop by again and let me know what you thought of it! Great presentation of this book’s themes and symbols. Conceiving of this character’s self-isolation in his basement as “minotaurizing” is a startling and revealing image. I happen to be reading Sofia Oksanen’s novel “Purge,” which also features a character isolated in either the basement or attic of his own house. This novel turns on the oppression of Estonia’s people by Russians and Germans during WWII and post-war period. I found this author through your review of her recent novel “When the Doves Disappeared.” Both these authors are finding ways to convey the terrifying isolation and abandonment they have witnessed, as you describe so well. I loved When the Doves Disappeared, so I will have to give Purge a try too. Thanks for the recommendation!